The Asian century has begun, but not in the way we think, according to Robert Kaplan. The U.S. he continued, has been bogged down in the Iraq and Afghanistan wars, and European military budgets have been declining, just as China, India, Japan, South Korea, and the Southeast Asian countries have built their military presences. As Kaplan told the standing–room–only crowd at the Petersen Automotive Museum, the U.S. needs to adjust the way its sees the world to prepare for the return and rise of the Indian Ocean region. The Cold War set the way Americans see the world today, Kaplan explained. The countries of Asia then had what he called “ox and cow armies” – massive, under-equipped, poorly trained land armies that looked inward, fixing roads, bringing in crops, fostering national consciousness. Americans meanwhile divided the world much like it appears in the Mercator projection – the map that splits the Indian Ocean region and confines it to the edges. The academy, think tanks, the State Department, the Pentagon and the CIA split the world into regions like the Middle East, Central Asia, South Asia, and East Asia. World War I and World War II, along with the Korean and Vietnam Wars, were Pacific and Atlantic conflicts. Monsoon is unique to the Indian Ocean, and key to its unity, Kaplan said. It’s more an economically crucial weather system than the storms that receive attention in the U.S. “In India, when there’s a good monsoon, and an election soon afterward, the government in power usually does very well. 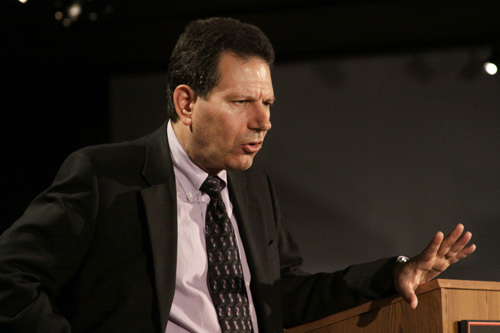 A good monsoon is a sign for a good economy,” Kaplan said. The monsoon winds flow in one direction for six months before reversing, predictable to a couple of days. Sailors could easily calculate distances and lengths of their journeys – meaning they could unite the countries around the ocean long before the era of steamships. “The Indian Ocean was one culture, an organic continuum since antiquity,” he said. Romans and Ancient Greeks knew of the monsoon winds; Arab navigators passed the information to Vasco da Gama. The Portuguese developed trading networks all over the Indian Ocean and began a 500 years period of dominance, later supplanted by the Dutch, the French, the British and finally the U.S.
Kaplan pointed out that the U.S. navy has shrunk from 500 warships in Ronald Reagan’s day to 286 today as the Chinese navy is growing and the Indian navy is set to become the third largest in the world. Despite the age of the jet engine and technology, he continued, commercial sea lines – which U.S. dominance currently secures – are crucial to most of global trade, particularly in oil and natural gas to what Kaplan called “the burgeoning middle class fleshpots of East Asia.” A canal being planned to cut across Thailand would create a new Panama, freeing trade from the narrow Strait of Malacca. The Chinese aren’t happy, Kaplan said, with the Strait of Malacca. Their foreign policy is propelled by acquisition of oil, natural gas, strategic minerals and metals that they need to build their huge middle class, not by ideology. To accomplish this acquisition and decrease reliance on the strait, Kaplan explained, China is building pipelines across Central Asia and building massive ports in Pakistan, Bangladesh, Burma and Sri Lanka, while giving military and economic aid to those countries. They aren’t military bases, Kaplan noted, because that would be too provocative to India. “China is at pains to convince people that its rise is benevolent and nonhegemonic,” he said. Instead, the Chinese efforts aim to protect sea lines of commerce, warehouse consumer goods, and provide visitation rights for warships. And, Kaplan noted in Q&A, China is starting to see, after its failure to help in the Indonesian tsunami, the importance of soft power to building hard power. But countries other than China and India play an influential role as well, Kaplan said, particularly Sri Lanka, Vietnam, and Taiwan. Sri Lanka sits in a particularly strategic spot in the Indian Ocean, close to all the main lines of communication. Thirty thousand merchant ships pass its coast per year, and China is building a port complex on its southern tip. After the U.S., Europe, and Canada pulled their involvement in Sri Lanka’s civil war because of human rights abuses by the government, China offered military aid and advice, propelling Sri Lanka’s government to a decisive win. In the case of Vietnam, Kaplan said, the U.S. doesn’t know the whole story. “For a generation of Americans, Vietnam is more than a word, it’s more than a war,” Kaplan said. “For the Vietnamese, the Vietnam War was just one degradation against their territory by a foreign invader.” After the U.S. left, the country fought a war with China, and Vietnam’s current budding alliance with the U.S. should come as no surprise. “Vietnam fears China,” Kaplan said. “Vietnam desperately needs the presence of the U.S. navy and air force.” Of course, the U.S. could never have a permanent base there, at the risk of provoking China. China is a natural fear for Taiwan as well. The countries may have 270 commercial flights per week going between them, but China also has 1,500 ballistic missiles pointed at Taiwan. A recent RAND study predicted that by 2020, the U.S. military won’t be able to credibly defend Taiwan. But Kaplan emphasized that a Chinese attack won’t be likely. “It won’t be necessary,” Kaplan said. “Taiwan will become part of a greater China.” This will free China to focus on bigger issues, like denying the U.S. navy easy access to its nearby seas. Just as the U.S. built the Panama Canal and expanded its navel power after consolidating its western frontier, Kaplan said, China will become a great sea power. Read an excerpt from Monsoon here. Read Robert Kaplan’s In The Green Room Q&A here.